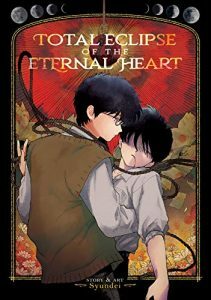 SEAN: I have not been able to remotely keep up with Kodansha’s digital-only titles, but I do appreciate them when they give us lots of series that may not have sales that justify a print license. So I’ll make my pick this week Ran the Peerless Beauty, a shoujo series that looks cool and cute. Let’s hope that’s not the slang term for “peerless”, though. ASH: I’m always happy to see a new volume of Gangsta, but this week the release I’m most excited about is Total Eclipse of the Eternal Heart. I adored Go For It, Nakamura!, so I’m thrilled to see more of the creator’s work in translation. MICHELLE: I’m definitely going to be checking out both of the titles mentioned already, but I’ll go with the debut of Love in Focus this time. I enjoyed the mangaka’s previous series much more than I expected to. Too bad this one is also quite short! MELINDA: There are a number of releases that intrigue me this week, including Ran the Peerless Beauty and Love in Focus, but BL horror from Opera wins the day for me. My pick is Total Eclipse of the Eternal Heart. ANNA: There are so many interesting manga series coming out this week, but it has been such a long time since I’ve seen a new volume of Gangsta. That’s my pick! Go For It, Nakamura! was one of my very favorite titles last year, so I am super hyped for Total Eclipse of the Eternal Heart!